A delicious summer chowder to make from scratch. Take a typical fast food meal. Corn is the sweetener in the soda. It’s in the corn-fed beef Big Mac patty, and in the high-fructose syrup in the bun, and in the secret sauce. Slim Jims are full of corn syrup, dextrose, cornstarch, and a great many additives. The “four different fuels” in a Lunchables meal, are all essentially corn-based. The chicken nugget—including feed for the chicken, fillers, binders, coating, and dipping sauce—is all corn. The french fries are made from potatoes, but odds are they’re fried in corn oil, the source of 50 percent of their calories. Even the salads at McDonald’s are full of high-fructose corn syrup and thickeners made from corn. Did you realize you were eating that much corn? Did you realize your meat had been fed on corn? That’s really what you get with packaged food. A bit of convenience, maybe a cleaner countertop, possibly a few dollars saved even; but a few ingredients you didn’t bargain for. The corn I am using in this recipe is an entirely different species than the hyper-processed grain varieties which make it into feed and syrups. Sweet corn is a summertime treat picked when immature and eaten as quickly thereafter as possible. At the market, look for moist, light brown, not black, fronds and feel through the husk for a plump body with full kernels. Try to make it the same day. You’ll remember this dish from my first Harlem dinner party last year. I still couldn’t figure out why, in 2002, Bon Apetit encouraged using canned and frozen corn for a recipe published in September. The concepts of fresh, local and seasonal have come a long way in these eleven years, so I have updated their recipe below with creamed corn and the chowder made from scratch. The shrimp is a bit flashy and gratuitous and could be eliminated to save about half the costs. This recipe serves about 6-8 and keeps pretty well for a few days. Clean your counter thoroughly, the kernels are going to fly and there’s no sense in wasting. Cut corn kernels from cobs (reserve cobs) and add to a large saucepan with water and butter. Simmer over medium heat, uncovered for about 5-7 minutes, stirring occasionally. Remove from heat. Using a dull knife, scrape the corn cobs into a small pot to extract all of the juices. Whisk in cream and flour then bring to boil over medium heat. Whisking constantly, cook for one minute until thickened. Stir cream into corn. Working on one side of the pot, puree the corn until about half of it is smooth. Stir to combine and remove to a large bowl. Add cream to processor with about 1 1/2 cups of cooked corn and pulse until smooth. Pour into a large bowl and stir in remaining corn. Mix 2 tablespoons of butter with flour and set aside. Melt 2 tablespoons of butter in a large pot over medium heat. Stir in onion, celery, and poblanos and cook until softened, about 5-7 minutes. The butter will brown a bit, so stir occasionally to keep the vegetables from burning. 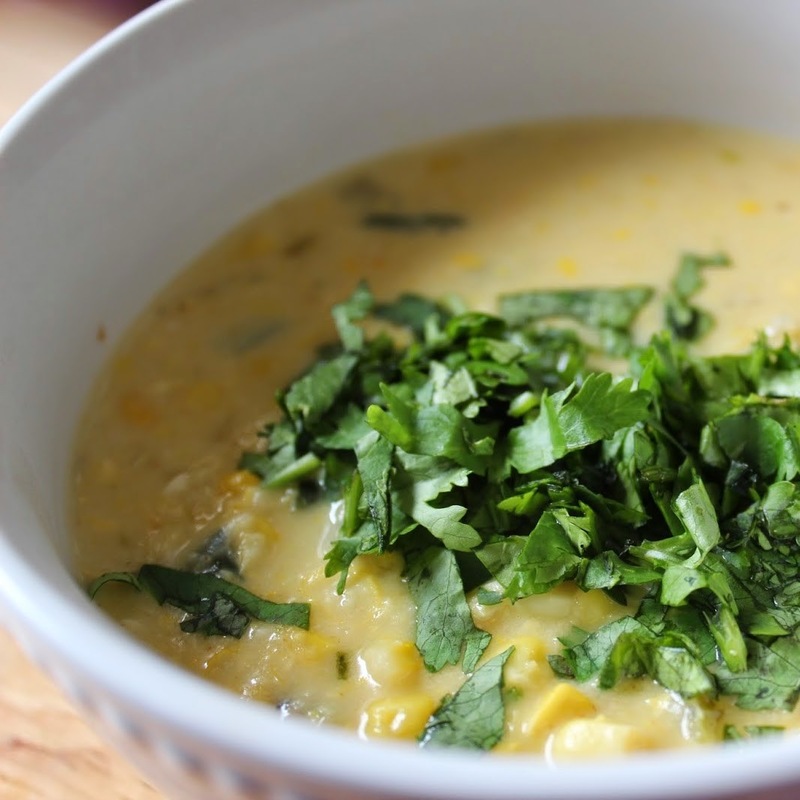 Stir in creamed corn, corn kernels, broth, cream, sugar (if using), and cayenne pepper. Simmer for 15 minutes, stirring occasionally. Season with salt and pepper to taste. Roughly chop shrimp and add to pot. Cook for another 5 minutes then readjust seasoning, if necessary. Allow to cool for a few minutes then ladle into bowls and garnish each with about a tablespoon of chopped cilantro.